Coconut oil is one of my favorite beauty products. It also has a long list of numerous health benefits. First, let me tell you all the ways you can use this for your outer body, head to toe. For starters, you can use it as a facial and body lotion. It makes your skin silky smooth. On your face and neck it works wonderfully even under make up. Speaking of make up, you can use it to remove make up! I was reluctant to use coconut oil on my face, thinking I would break out. Coconut oil will not cause break outs. It absorbs nicely and leaves your skin smooth and dewy looking. I love using it in place of body lotion. Coconut oil also helps to relieve eczema, body odor, dry areas, preventing fungal infections and blemishes. Coconut oil will work wonders on your hair. I use it as a daily conditioner and deep conditioner every couple of weeks. After shampooing, I like to rub a half teaspoon in my hands and then all over my hair especially the ends. No need to rinse. Since I have been using it I have noticed my hair is much stronger, shinier and thicker. The smoothies and juices are partly responsible for that, too. For deep conditioning, use 3-4 spoons and massage in scalp all the way to ends. Leave in overnight, if possible, or at least for an hour, then rinse and shampoo lightly. Make sure you are using a good shampoo that doesn’t strip your hair. Some people have also reported less gray hairs after using coconut oil. Adding a few drops of lavender oil is nice and calming and makes your hair smell really good. Coconut oil mixed with baking soda and a few peppermint drops makes an excellent toothpaste. Coconut oil is also good for oil pulling. Coconut oil also makes the best sexual lubricant. Plus you can both give each other sensuous massages and have awesome silky skin. Coconut oil should not be used with condoms, as oils cause condoms to break down. Okay, at this point I probably sound like I am selling this stuff. I wish I were! I’m not! I just love it so much. The best coconut oil to buy is raw, virgin, unrefined and organic. Last few times at the grocery, I could only find unrefined organic but not raw. I think everyone should eat a spoon of this a day! It’s great for your pets, too. I like to give my cats a few drops of it. They love the taste. Their coats are healthy and beautiful. Research shows that many people of the Pacific Islands, who get about thirty to sixty percent of their intake of total calories from saturated coconut oil, have almost non-existant rates of cardiovascular disease. Half of the fat in coconut oil is a special type called lauric acid. Your body converts this into monolaurin. Monolaurin has anti-protozoa, anti-bacterial and anti-viral properties. The only other natural source of monolaurin can be found in mother’s milk. 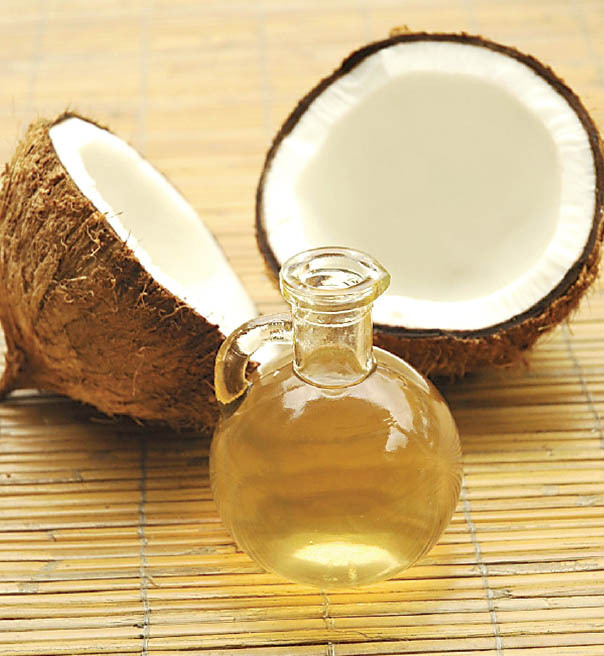 Coconut oil is a treasure chest of MCFAs aka medium chain fatty acids or medium chain triglycerides – MCTs. Most of the vegetables oils and seed oils are made up of long chain fatty acids – LCFAs, or long chain triglycerides – LCTs. These have larger molecules so they are very hard for your liver to break down and are stored away as fat. But since the MCTs are smaller they are easily used by your liver and without the spike in insulin. This actually helps your body to use fat for energy and boosts your metabolism. Coconut oil has also been reported to raise the HDL, which is the good cholesterol, treat hypothyroidism, reduce the risk of developing Type 2 Diabetes. Some have even stated that has even helped to reverse symptoms of Alzheimers! Is this convincing enough? I was happy with the just beauty benefits! I suspect that research studies will come out with so much more info on coconut oil. I like to add it to my smoothies, juices (especially carrot juice for better beta carotene absorption), oatmeal, raw chocolate, rice and more. I love the coconut taste. Try it! I promise you will like it!